Need help with your small business social media? Check out these 10 tactics based on 2019 Inc 500 Social Media Research by UMass Dartmouth. 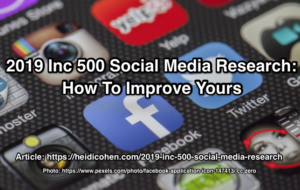 The post 2019 Inc 500 Social Media Research How To Improve Yours appeared first on Heidi Cohen.